Rick-rack (also spelled “ric rac”), I believe, is one of those embellishments that can add a textural accent to many garments. It can look charming and vintage, or (in some people’s mind) add a distinctly “homemade” aura to a garment. But no matter what your opinion on the humble zig-zag trim, it can’t be denied that it can add a pop of color or help define a shaped seam. 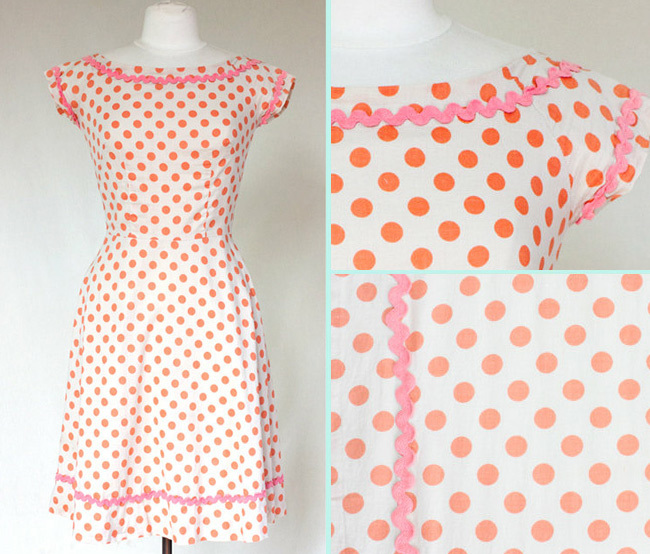 This beautifully colorful vintage dress is one of the more restrained uses of rick-rack I’ve come across, and yet the color scheme (orange dots and pink rick-rack) make the look quite exuberant. This sort of light trimming and bright fabric is perfect for more simple patterns like the Peony. I adore this version of the Licorice dress (from the Colette Sewing Handbook) by Rochelle. The bright red rick-rack is perfect with the subtle stripe, and really sets off the contrast and neckline and sleeve cuffs. Notice how she further tied in the trim color by using buttons as accents at the neckline—clever! This would be quite an undertaking for any seasmstress—and require a lot of trim! But it’s a very textural use of rick-rack, and since the tone matches that of the dress material, it looks almost like it is part of the fabric. Again, this sort of all-over treatment is best for more simple silhouettes, especially those lacking complicated seaming as the rick-rack has to be applied as the sections are completed for that seamless look. Images: Polka Dot Dress, Rochelle’s Licorice Dress, 1950s Sundress. Love the article on rick-rack. My mother was great with this trim. These are some great ideas for embellishing! love the spotty vintage number – i have just bought the peony pattern and was thinking a plain fabric but that’s got me thinking again! and Rochelle’s licorice dress is lovely! wish i could get my hands on the handbook as the patterns look great but can’t find it in the UK! I bought the Colette sewing handbook recently from rucraft.co.uk, looks like they still have it in stock at the moment aswell. I got mine from bookdepository.co.uk – and they ship free…. Just recently I used matching rick rack trim on the outside of a stretch knit top to stabilize the shoulders. It’s so subtle, you can bearly see it since it’s white on white. But I’ll definitely do it again because I’ve tons of rick rack and not nearly enough clear elastic (my usual go-to stuff for stabilizing shoulder seams). That is such a great idea for using rick rack in a more utilitarian way! Rochelle’s dress is just gorgeous! And I absolutely adore the orange/pink colour scheme of the first dress. What a great post-very clever ideas! I love rick-rack, but am always afraid to use it and have my projects look too crafty. Its really cute with polka dots, and I especially like how the trim is spaced farther away from the hemline than I am used to seeing it. Rick-rack is one of my very favourite trims! I have yards in many colours in my stash and plan on using some on my Hazel dress. How wonderful to see Rochelle’s Licorice dress featured! She really did a marvellous job! Wow, that blue rick rack dress would be so lovely in white. I love rick rack but i find it can be hard to incorporate w/o looking crafty. This is great inspiration. So cute! Especially love the blue dress rick-rack all over…. I love ric rac it’s my favorite embellisher. I love that second dress with the navy polka dots. And I have a skirt somewhere that I plan to embellish with that last version……but rather than the whole dress, just perhaps 4 or 5 rows of a contrasting color. I love ric-rac, and recently got a bunch of packages of it from my mom. Would you be able to do a tutorial on applying it to a dress? I have no clue how to sew it neatly onto a project! Thank you Casey! I saw it today! My moms homecomming dress what pink and had details of white ric rac. I think that if used in the right way, it can be very cool and chic. Love the blue one! I just used rick rack for the first time a few weeks ago on some shorts for my daughter. I really liked how they looked but my husband didn’t. I am seething with jealousy over Rochelle’s dress. Love. it. 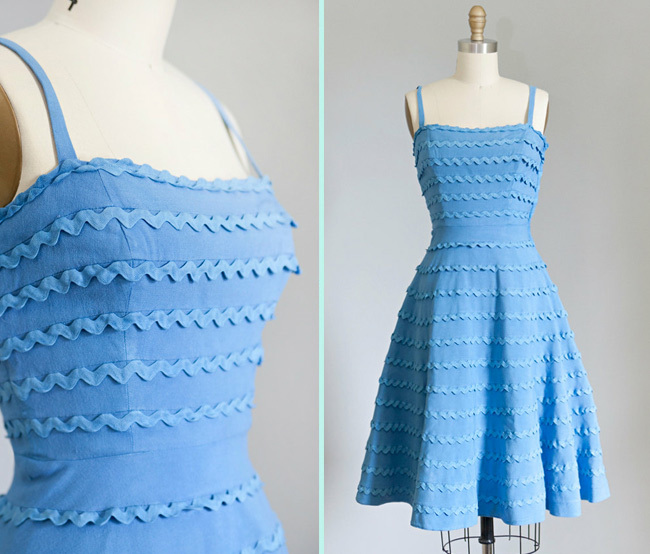 I’m usually not a huge fan of ric rac, but I do like the monotone look with the blue dress! How creative! It looks like it might be caught in the horizontal seams of the dress, which certain makes it easier than having to transfer lines on to each piece! I found a great pdf of sewing tips for rick rack that I’ll be sharing in the weekly links roundup. So stay tuned! I was recently given several old back issues of Piecework magazine (a most dangerous publication–now, I have at least 10 more sorts of needlework I want to try!). One issue had directions for using rick rack to make very pretty lace!